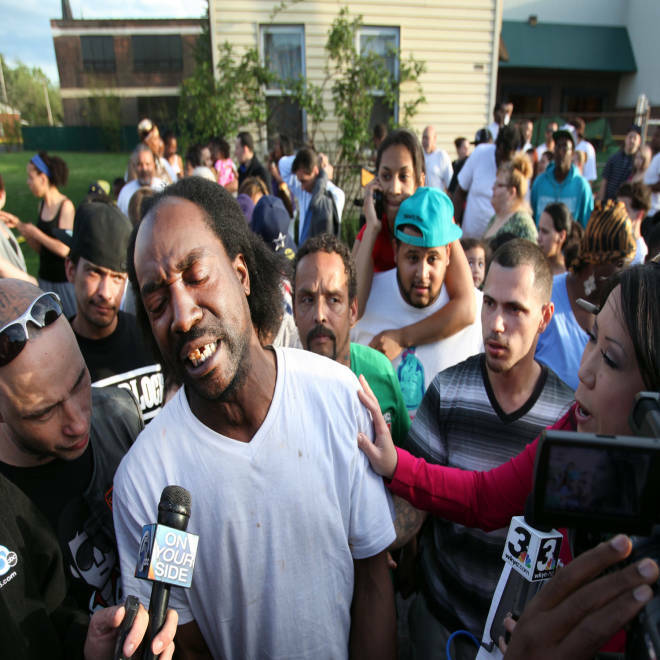 Charles Ramsey talks to members of the media as people congratulate him on helping three women escape from captivity in a Cleveland home on May 6. Ramsey will tell his story in a book that will be released in December, his publisher announced Sunday Dec. 22. Charles Ramsey, the Cleveland man credited with rescuing three women from a decade of captivity under Ariel Castro’s roof, has signed a book deal, despite his previous lack of interest in attention and publicity, a publishing company announced Sunday. Cleveland publishing house Gray & Co. signed the deal for a memoir by Ramsey on Thursday, the publisher said in a statement. Ramsey, 44, garnered national attention after his unfiltered response to media attention he received for breaking down his next door neighbor’s door to rescue Gina DeJesus, Michelle Knight, Amanda Berry and Berry's daughter from a house where they had been imprisoned by their kidnapper for about 10 years. Ramsey’s unfiltered accounts during television interviews of the day he rescued the women in May were remixed, posted on YouTube and quoted incessantly by Twitter users. "What you saw on TV doesn't even begin to tell the story," Ramsey said. “Bro, I knew something was wrong when a little pretty white girl ran into a black man's arms,” Ramsey told a reporter shortly after the ordeal. Randy Nyerges, who has co-written a book with former Cleveland Browns defensive back Hanford Dixon and served as a Senate speechwriter, will coauthor the book with Ramsey. “Charles says outrageous things, but what a story he has,” Nyerges said, according to Gray and Co.’s announcement. Ramsey’s resistance to the label of “hero” and refusal of giveaways made Americans even fonder of the man who may have cursed a few too many times while contacting the police about his discovery but acted bravely during the traumatic situation. Ramsey’s memoir — which is not yet titled — will describe the rescue, the short time Ramsey spent living next door to atrocities he was unaware of and the instant fame that ensued after his heroic actions, Gray and Co.’s release said. Ramsey is also expected to detail his earlier years, including time he spent in prison, according to Gray and Co.
Ramsey and Nyerges have been collaborating on the book since the beginning of December, and it is slated to be published in spring 2014, which is when a memoir by Knight is also scheduled to be released. Berry and DeJesus are also set to document their harrowing experiences in a book due out in 2015. Castro was sentenced Aug. 1 to life plus 1,000 years. He hanged himself inside his cell on Sept. 3.